A central part of the American Right’s false Founding Narrative is that the Tenth Amendment trumps the Constitution’s creation of a powerful central government that possesses a mandate to do what’s necessary to provide for the country’s “general Welfare.” In Right-Wing World, the Tenth Amendment gives nearly all powers to the states. 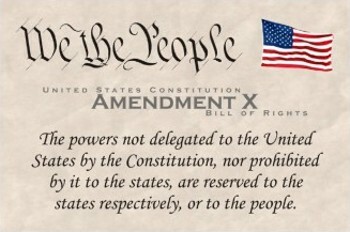 Yet, the reality is that the Tenth Amendment is one of the most meaningless of all the amendments to the U.S. Constitution, except maybe the Eighteenth, which prohibited the sale of liquor and was subsequently repealed by the Twenty-first Amendment. But the relevant point is that the Constitution granted nearly unlimited power to the U.S. Congress to enact legislation on behalf of “the general Welfare” – within the context of republican governance, with the approval of the U.S. president, and with the sign-off of the U.S. Supreme Court. 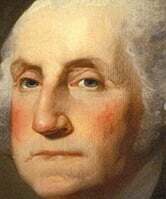 Image: President George Washington, who detested the concept of states’ rights because of the harm it did to the Continental Army and to prospect of building a strong nation. This concept — embraced by James Madison, Alexander Hamilton, George Washington and other Framers — was to rely on the Constitution’s intricate checks and balances to prevent government overreach, not to hamstring the people’s elected representatives from doing what was necessary to build the nation both then and in the future. But General George Washington, in particular, despised the concept of states’ rights, since he had seen his Continental Army go without pay and supplies – to nearly starve – during the Revolutionary War. He was joined in this sentiment by his bright protégé Madison and his old wartime aide-de-camp Hamilton. I realize that this reality – or my pointing it out – makes some people angry. They want to believe that their hatred of the federal government matched what the Framers felt. And the Right has done a remarkable job in propagandizing a large segment of the U.S. population into believing this invented narrative. Some right-wing believers even insist that any action by the U.S. government to provide for “the general Welfare” is “unconstitutional,” such as the Affordable Care Act which addressed what was an undeniable threat to “the general Welfare,” the fact that tens of millions of Americans were forced to live in fear of premature death because they could not afford health insurance. Madison, then a staunch Federalist, had favored giving even more power to Congress and making the states even more subordinate. “Madison wanted the federal assembly to have a veto over the state assemblies,” wrote David Wootton, author of The Essential Federalist and Anti-Federalist Papers. But Madison’s veto idea was jettisoned in favor of giving the federal courts the power to judge whether state laws violated the Constitution. Despite these few concessions, the Constitution emerged from the secret meetings in Philadelphia as a stunning assertion of federal power. Anti-Federalists immediately recognized what had happened and rallied strong opposition to the new governing framework. The Constitution’s broad powers were particularly alarming to southern slaveholders because of the prospect that the North would eventually gain economic and political supremacy and push through anti-slavery legislation that would wipe out the South’s vast investment in human chattel and thus destroy the region’s plantation aristocracy. Faced with these alarms about federal powers, Madison agreed to propose some limiting amendments though he felt that a Bill of Rights was superfluous. Nevertheless, some of the first ten amendments did specifically restrict Congress’s power. For instance, the First Amendment begins with the phrase “Congress shall make no law…” while other amendments assert specific rights of citizens. The Tenth Amendment, however, simply states that powers not granted to the national government by the Constitution remain with the people and states. Thus, the scope of the Tenth Amendment is entirely dependent on what preceded it, i.e., the nearly unlimited powers that the Constitution granted to the national government. In other words, if the Framers declared – as they did – that Congress could enact any law that it deemed necessary to promote “the general Welfare” and that federal law would be supreme, then the Tenth Amendment meant almost nothing since there were few powers left over for the states. It was a sop to the Anti-Federalists. Still, the Constitution’s opponents – especially slave owners in Virginia – did not just surrender after ratification. Instead, they devised a clever strategy for preventing the possibility that Congress would wipe out their massive capital investment in slavery. Behind the charismatic Thomas Jefferson, who was in Paris in 1787 and thus did not participate in the Constitutional Convention, the plantation aristocracy simply pretended that the Constitution didn’t mean what it said. Jefferson, one of Virginia’s biggest slaveholders and a masterful wordsmith, promulgated the absurd notion of “strict construction,” which meant that only specific powers mentioned in Article One, Section Eight could be exercised by Congress. Regarding domestic policy, that meant such relatively narrow powers as coining money, setting up post offices, establishing rules for nationalization, regulating interstate commerce, etc. Jefferson’s “strict construction” was absurd because it ignored the obvious intent of the Framers and the need for the United States to act in ways that could not be specifically anticipated in 1787, a reality that confronted Jefferson himself after he was elected president in 1800. Three years later, President Jefferson had the opportunity to buy the Louisiana Territories from France but there was no wording in Article One, Section Eight about expanding the size of the United States. Clearly, the Framers had enacted elastic phrasing for just such an eventuality but Jefferson had insisted on his crazy “strict construction” argument. So, what did Jefferson do? He simply ignored his previous “principle” and implicitly accepted the Federalist interpretation of the Constitution, which they had principally authored. Congress approved the purchase of the Louisiana Territories doubling the size of the United States and giving Jefferson what is regarded as his greatest accomplishment as president. Though even Jefferson – the inventor of “strict construction” – chose to repudiate his own argument, this insidious notion has survived the past two centuries in the fetid swamps of Right-Wing World. It was a factor in the South’s resistance to anti-slavery restrictions that preceded the Civil War and it has been touted in modern times by such right-wing luminaries as Supreme Court Justice Antonin Scalia as part of his self-serving “originalism,” i.e., whatever Scalia wants done must have been what the Framers wanted done. The real history of the Constitution has little impact on these ideologues. They have simply found it useful to wrap themselves in the cloaks of the Framers even when that requires distorting what the actual Framers intended. While there can be legitimate arguments about the proper size and scope of the federal government (or for that matter any government), the facts should be the facts and the history should be the history. The Right, however, has deceived millions of Americans into believing a false narrative about the U.S. Constitution and the nation’s Founding – for the purpose of distorting the debate.